At the 39th IBEW International Convention, the delegates of the IBEW passed the Resolution – “Renewed Commitment to the Code of Excellence”. 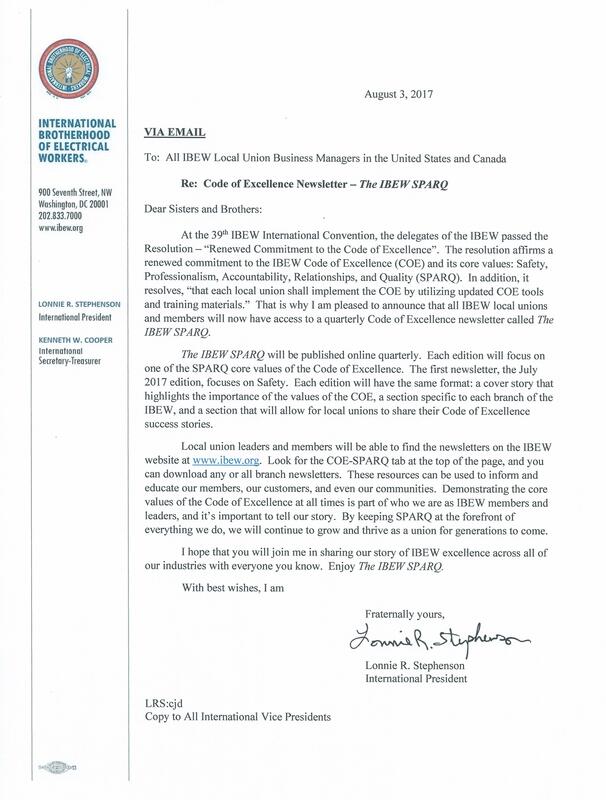 The resolution affirms a renewed commitment to the IBEW Code of Excellence (COE) and its core values: Safety, Professionalism, Accountability, Relationships, and Quality (SPARQ). 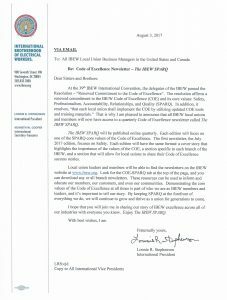 In addition, it resolves, “that each local union shall implement the COE by utilizing updated COE tools and training materials.” That is why I am pleased to announce that all IBEW local unions and members will now have access to a quarterly Code of Excellence newsletter called The IBEW SPARQ. The IBEW SPARQ will be published online quarterly. Each edition will focus on one of the SPARQ core values of the Code of Excellence. The first newsletter, the July 2017 edition, focuses on Safety. Each edition will have the same format: a cover story that highlights the importance of the values of the COE, a section specific to each branch of the IBEW, and a section that will allow for local unions to share their Code of Excellence success stories. Local union leaders and members will be able to find the newsletters on the IBEW website at www.ibew.org. Look for the COE-SPARQ tab at the top of the page, and you can download any or all branch newsletters. These resources can be used to inform and educate our members, our customers, and even our communities. Demonstrating the core values of the Code of Excellence at all times is part of who we are as IBEW members and leaders, and it’s important to tell our story. By keeping SPARQ at the forefront of everything we do, we will continue to grow and thrive as a union for generations to come. I hope that you will join me in sharing our story of IBEW excellence across all of our industries with everyone you know. Enjoy The IBEW SPARQ.